Transportation Supervisor Bradley George delivers his report to the Greenfield Exempted Village Schools Board of Education at Monday’s meeting. Superintendent Joe Wills is heading off the job a month earlier than previously reported, which means that as of Friday, Interim Superintendent Ron Sexton will be on the job until the Greenfield Exempted Village Schools Board of Education chooses a permanent replacement for Wills. At Monday’s school board meeting, the board amended Wills’ original retirement date of Feb. 28 to Jan. 31. Following the meeting, Wills said he had made known to the board upon his resignation last year that he was flexible on the date. He said that his actual date of retirement was dependent on the transition of his leaving with Interim Superintendent Ron Sexton taking over. That transition “has gone well,” Wills said, and he is ready to pass the reigns. Sexton will officially begin serving as interim superintendent on Friday, Feb. 1, a measure approved by board members at Monday’s meeting. “My time in the district has been a great experience, and I want to thank the board of education for the great opportunity offered to me almost six years ago,” Wills said Tuesday. “I want to thank our students, staff and family members for the hard work and support of the schools. The tremendous amount of community support for Greenfield schools is like no other,” he said. As previously reported, Wills’ resignation for the purposes of retirement was accepted by the school board at its October meeting. In December, Sexton, a retired superintendent of the Wilmington schools, was hired as a consultant to eventually become interim superintendent upon Wills’ retirement. On a related matter, Sexton reported that he has been speaking to staff about what they would like in a superintendent. He said everyone has been “very appreciative” of the board’s request for input on the superintendent search. At a recent meeting held in conjunction with the village, board members took input from members of the public as to what they want in a superintendent. All input will be a taken into consideration as the board chooses a permanent superintendent. The elementary building has been secured for a number of years with office staff able to view those seeking entry via camera. The superintendent said weather has been, and continues to be, a concern. Wills said administrators make their determinations on school delays and cancellations as early as they can. Transportation Supervisor Bradley George and his staff are on the roads early, as is Wills, when weather hits. 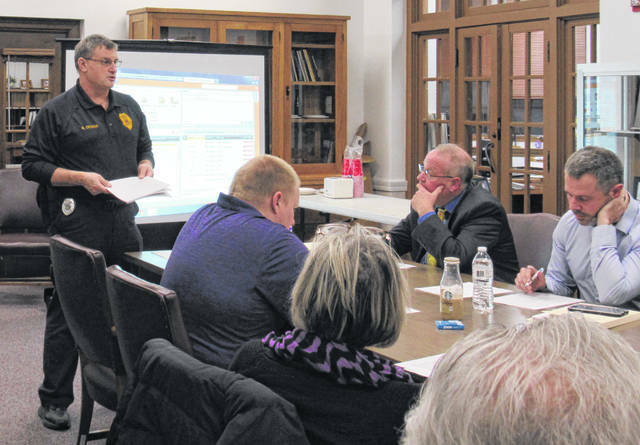 “They are consistent in what they look for,” said Willis, noting that school officials also talk to township trustees, the county, and surrounding school districts before making their determinations on road conditions. Wills said the bottom line is that the safety of the students and staff is of the utmost importance. The board also heard a report from George on the state of the bus fleet; how various software being implemented is making tracking buses, mileage and maintenance more efficient; streamlining and adding routes to help ensure no child is on the bus for more than 45 minutes; as well as George’s goals for the future of the fleet. Board legislative liaison Charley Roman reported that HB 502 has been signed by the governor and is now a law requiring that certain public school employees receive youth suicide awareness and prevention training every two years. Roman said he is also monitoring HB 66, which would require a school to notify a parent within two hours after the start of school if the student is not there, a practice that Greenfield schools have been engaged in for years. During Monday’s meeting, the school board recognized winners in the elementary spelling bees and the middle school spelling and geography bees. Each student received a certificate and a pin from the board. Employment recommendations as approved by the board on Monday are: Jared Halter, high school math teacher; Lauren Garman, high school guidance counselor; certified substitutes Ryan Faulconer, Josh Carroll, Kaitlin Roush, Brooke Mossbarger, Olivia Rose, Charlie Hargrave and Lauren Garman; Jessica Hales, clerical, monitor and cafeteria; and Loretta Smith, clerical, monitor and cafeteria. The Greenfield Exempted Village Schools Board of Education is scheduled to meet again in regular session at 7 p.m. Feb. 25 at Rainsboro Elementary. Angela Shepherd is a stringer for The Times-Gazette.